We already knew that our brain hides an effective biological clock that dictates that we feel sleepy at night or get hungry at midday. But that’s not our only internal timer according to what recent genetic studies have discovered: there are thousands of hidden biological clocks for the rest of the body conducting specific activities in the heart, pancreas, skin, lungs… Keeping these other clocks synchronized with the brain, thanks to a regular daily routine, helps control weight and can optimize medical treatments such as chemotherapy for cancer. The human body comes equipped with a biological clock that synchronizes it with the rhythm of nature. 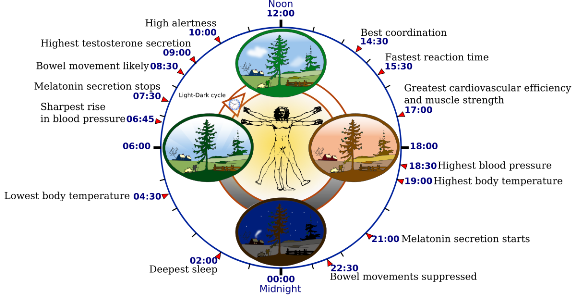 This body clock binds us to the circadian cycles of light and dark, due to the rotation of the Earth on its journey around the sun. Our internal clock puts us to sleep at dusk and awakens us with the dawn. These cycles of 24 hours not only determine sleep rhythms, but they also affect temperature regulation, hormone production or the workings of the digestive system. The first person to do research on circadian rhythms was the French astrophysicist Jean-Jacques d’Ortous de Mairan in 1729, when he designed an experiment to determine whether living things kept these cycles. 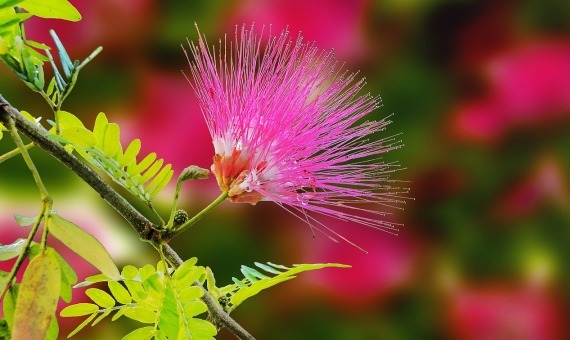 First, Mairan observed how a mimosa plant opened its leaves during the day and closed them at night. Later, he discovered that the same plant followed the pattern in the absolute darkness of a closet (at least for a while). Something inside the plant seemed to maintain that daily opening and closing. It was not until the 1970s that the location of the circadian clock was pinned down in humans. The timer is found in the suprachiasmatic nucleus, a brain structure located behind the eyes, in the hypothalamus, which detects the light signals that enter through the pupils, distinguishing when it’s day from when it’s night. The suprachiasmatic nucleus sends signals through the brain and body, which control the daily changes in blood pressure, temperature, level of activity and alertness, and also indicates to the pineal gland in the brain when to release melatonin, something that only occurs at night to induce sleep. Thanks to advances in research at the genetic level, we now know that in addition to this central clock, located in the brain, there are many other peripheral clocks scattered around the body, which control specific functions. These thousands of peripheral clocks function similarly to the central clock, but in the heart, liver or skin. Thus, in response to an external stimulus, a set of genes inside muscles and tissues is activated that causes an explosion of cellular activity (that is, the genes provocate specifics functions in muscles and tissues). Each region has its time of greater and lesser intensity. According to chronobiologist John Hogenesch of the University of Pennsylvania (USA), who in 2014 published the atlas of circadian genes of the mouse, the activity of almost half the genes of mammals varies regularly along the day. For example, activity in the lungs is reduced at night because that is when they are more likely to suffer an asthma attack. In 2000, a study in mice found that peripheral clocks can be decoupled from the central clock by changing the timing of meals. To achieve this, they fed the rodents only during the day when they are usually asleep. The mice with the decoupled watches gained more weight while eating the same as those who had them synchronized. In humans, something similar happens. According to a study by nutritionist Gerda Pot, of King’s College London, who analysed the habits of 5,000 inhabitants of England with data collected since 1946, adults who do not eat regularly are at a greater risk of cardiovascular problems and diabetes. Furthermore, the presence of diabetes, obesity and cardiovascular problems among night workers is greater. And people who do not keep a regular eating schedule, or those who live at night and sleep during the day, experience more changes such as chronic fatigue or lack of appetite. To keep accurate time in all the biological clocks, the ideal is to have a rigid daily routine with regard to rest, physical activity and nutrition. Although a monotonous lifestyle suffers from bad press, it does help the proper functioning of the body. Having all one’s body clocks synchronized controls body weight and can be critical for optimizing certain treatments. For example, taking pills for high blood pressure before going to sleep, instead of in the morning, is more effective. In the case of cancer treatments, applying chemotherapy according to the rhythms of the body can have significant advantages. Cancer cells are characterized by being arrhythmic and constantly doubling in number, in a body that keeps its cycles well synchronized. Giving chemotherapy at the right time could attack the tumour with fewer side effects for the rest of the organ or tissue, provided it’s not active. And for that we must know in detail the rhythm of its specific biological clock.